Headcount is expensive. It comprises as much as 80 percent of annual company expenses, so getting the headcount budget right is important. Anaplan takes the headcount and payroll planning process out of spreadsheet silos and puts it into one dashboard—enabling finance and HR to track actual and forecasted headcount with the right workforce planning tools. Begin the top-down phase of the strategic workforce planning process by feeding in financial and HR system information. Model “what-if” changes in location, salaries, benefit assumptions, and reporting structures to see, in real time, how changes affect finance and the organization. Model average salary, benefit and tax rate assumptions, and seasonality assumptions, by geographic location. In the bottom-up workforce planning phase, turn to your lines of business and HR partners to shape and adapt your plan. 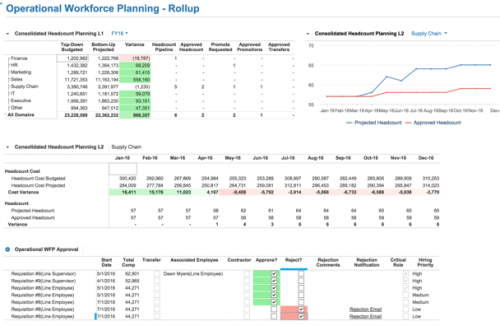 Begin your operational bottom-up workforce planning process by inputting detailed requisitions, hires, leavers and joiners for each department, and cost center into the Operational Workforce Planning dashboard. Identify your star performers in the context of your hiring needs, and collaborate on retention plans to streamline and accelerate the new hire decision-making process. Heat maps within a dashboard reveal key metrics and trends when assessing your talent, identifying promotions and backfill needs as each line of business and HR partner inputs their hiring needs. Collaborate with your executive team, marrying your information from your top-down plan with your bottom-up real headcount requests to agree upon a prioritized list of roles to recruit for, in line with the strategic objectives for the company. Why Anaplan for Headcount and Payroll Planning? Show a single, complete, and accurate view of your people and costs, and feed in up-to-date headcount and financials from your transactional system. Plan and model scenarios at a level of detail that helps you effectively make necessary business decisions around workforce headcount and payroll plans. 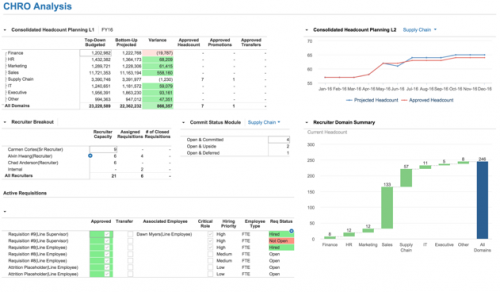 Manage for changed business conditions, internal needs, and external reporting requirements. 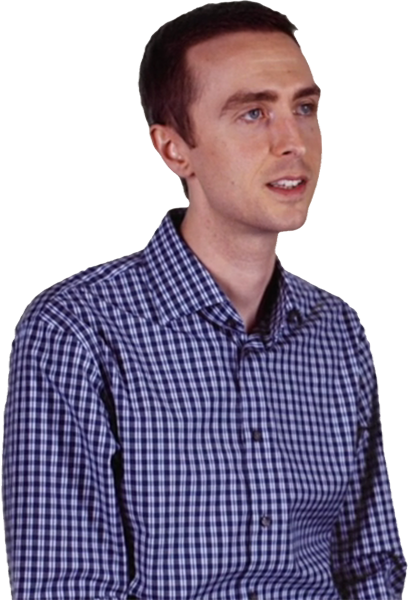 Wyatt Albertson talks about how Tableau uses Anaplan to better plan their headcount and sales growth with a solution managed by the business user—all without using spreadsheets. It all connects. 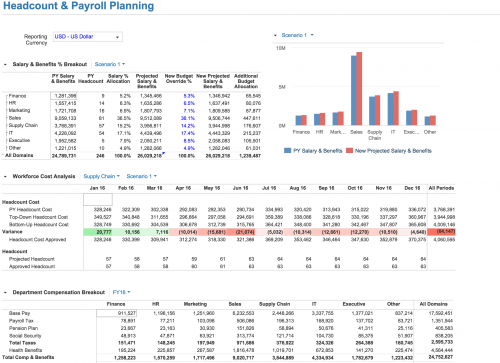 Show a single, complete, and accurate view of your people and costs, and feed in up-to-date headcount and financials from your transactional system.Plan and model scenarios at a level of detail that helps you effectively make necessary business decisions around workforce headcount and payroll plans.